Who knew there were so many things to know about batteries? Learn more about VRLA (Valve Regulated Lead Acid) batteries, which are typically seen in applications for UPS (Uninterruptible Power Supply) systems. Do I have to replace my UPS batteries with the same brand of batteries? Titan Power recommends that if you use brand X and need to replace one or two batteries in the string, you should use the same brand because they will have the same characteristics. If you need to replace the whole string, then you can change brands with fewer risks. Who are the major and best battery manufacturers? There are many battery manufacturers, but the major ones are: C&D, Enersys, CSB, GNB, Yuasa and Panasonic – to name a few. Batteries can fail for a multitude of reasons, but common reasons include: high or uneven temperatures, inaccurate float charge voltage, loose inter-cell links or connections, loss of electrolyte due to drying out or damaged case, lack of maintenance, or aging. As batteries sit unused, with no charging regimen, their battery life decreases. Due to the self-discharge characteristics of lead-acid batteries, it is imperative that they be charged periodically during storage. Otherwise, permanent loss of capacity will occur. To prolong shelf life without charging, store batteries at 50°F or less. The standard lifespan for VRLA batteries is three to five years, and for wet-cell batteries up to 20 years. However, expected life can vary greatly due to environmental conditions, the number and depth of discharge cycles and adequate maintenance. Have a regular schedule of battery maintenance and monitoring to ensure you know when your batteries are reaching their end-of-life. What is the “end of useful life”? The IEEE defines “end of useful life” for a UPS battery as being the point when it can no longer supply 80 percent of its rated capacity in ampere-hours. When your battery reaches 80 percent of its rated capacity, the aging process accelerates and the battery should be replaced. Though sealed batteries are sometimes referred to as maintenance-free, they still require scheduled maintenance and service. The term maintenance-free refers to the fact that they do not require fluid. Preventive maintenance is the key to maximizing your UPS battery service life. How is battery performance generally measured? Batteries are generally rated for 100+ discharges and recharges, but many batteries show a marked decline in charging capacity after as few as 10 discharges. The lower the charge the battery can accept, the less runtime it can deliver. Look for batteries with a high-rate design that sustains stable performance for a long service term. If I add more batteries to a UPS can I add more load? Adding more batteries to a UPS can increase the battery runtime to support the load. However, adding more batteries to the UPS does not increase the UPS capacity. Be sure your UPS is adequately sized for your load, then add batteries to fit your runtime needs. 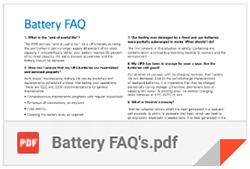 Click here to download the reference guide of these and more UPS battery frequently asked questions. This entry was posted in Power Distribution Unit, Titan Power, UPS Maintenance and tagged UPS Batteries. Bookmark the permalink.